If your baby has “flat head” from lying on his back, don’t worry – it will go away eventually, but you can also prevent it from happening again. Here’s what you need to know. In Canada, three babies die of Sudden Infant Death Syndrome (SIDS) each week, according to Health Canada. 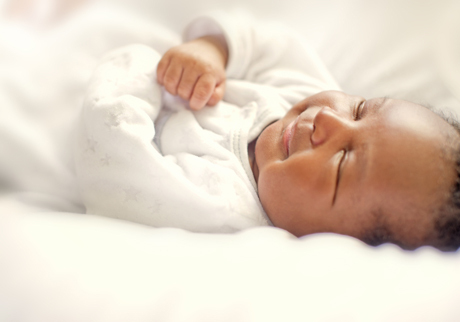 However, research shows the rate of SIDS has declined by more than 50 percent over the past decade. The Back to Sleep campaign (initiated by the Canadian Foundation for the Study of Infant Deaths, the Canadian Paediatric Society, the Canadian Institute for Child Health and Pampers Canada) says that babies who sleep on their backs are much less likely to die of SIDS. Babies usually like to look at the room they’re in rather than the wall, so put your baby’s head at one end of the crib one day, and at the other end of the crib the next day. That way he can see the room without lying on the same side day after day, and he’ll be less likely to develop a flat spot on one side of his head. A mobile placed on the room-side of the crib can also help encourage your baby to look that way. Most importantly, make sure your baby has lots of supervised tummy time while he is awake. This will develop his muscles, prevent flat head, and also allow him to get a good look at the world around him.